This leading team of scholars presents a fascinating book about change: shifting political, economic and cultural conditions; ephemeral, sometimes even seasonal, multilingualism; and altered imaginaries for minority and indigenous languages and their users. 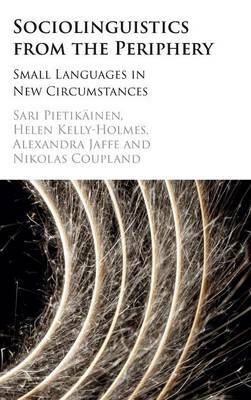 The authors refer to this network of interlinked changes as the new conditions surrounding small languages (Sámi, Corsican, Irish and Welsh) in peripheral sites. Starting from the conviction that peripheral sites can and should inform the sociolinguistics of globalisation, the book explores how new modes of reflexivity, more transactional frames for authenticity, commodification of peripheral resources, and boundary-transgression with humour, all carry forward change. These types of change articulate a blurring of binary oppositions between centre and periphery, old and new, and standard and non-standard. Such research is particularly urgent in multilingual small language contexts, where different conceptualisations of language(s), boundaries, and speakers impact on individuals' social, cultural, and economic capital, and opportunities.